SOS Dutch government legitimates animal cruelty. Stand up for animal welfare! Massive starvation, malnutrition and hundreds of dying and crunching locked in animals is not a situation that you expect to happen in a modern civilized society and to be supported and legitimated by a government. Unfortunately, this is currently happening in the Netherlands, due to a failed experiment, machismo and deceit. At the end of the sixties the Dutch government created a nature reserve of 56 square km, the Oostvaardersplassen, an unique area in new land. A success story to start with. For the landscape management grazing horses, deer and bovine were introduced, domesticated species, however adaptive to a wild environment. There was no herd management: everything should be natural. The introduction of the grazers was a success, the landscape was formed, the herds grew. But then problems started. Every first-year biology student learns about population ecology. Populations are regulated by very basic principles: migration, predation, diseases, starvation, conflicts. If migration is impossible because the area is surrounded by fences and there are no corridors to other areas and there are no predators, the only other options for population control are less natural. Winter 2018 populations have grown out of control and bigger than the area can feed. 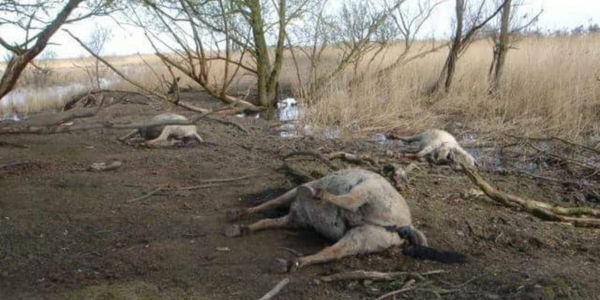 Due to winter conditions the population of cattle, deer and horses are massive dying from starvation, there is suffering, and we can speak about animal cruelty. The responsible management, The State Forest Service, is refusing to provide supplementary food. Volunteers and farmers trying to help the animals are prosecuted by law reinforcers. Rangers are trying to keep the suffering out of the publicity and are shooting animals. Food provided by volunteers is removed by rangers, who probably are only acting as them they were told, but are also not taking position against this cruelty. Ministers are defending the management and explaining that everything is still according to management plans of at least four years old. The responsible management organisation is pretending to be still in control and that volunteers are endangering the life of the animals. It is not only time to conclude that this experiment is gone out of control, the reaction of the responsible organisations is showing a lack of knowledge and empathy. Animals are suffering and victim of power play between organizations, politics and public. The State Forest Service claims to be a nature conservation organisation, but what in this nature reserve is different from a zoo or a farm? The animals are locked in and the owner has full responsibility for their welfare. Any farmer or zoo abusing its animals managing their population as this organization, would be legally prosecuted. Why is this management tolerated, just because it is a former governmental organization. As chairman of an international NGO, I try every day to work for conservation and animal protection. It is heart-breaking to see this happening in my own country, a country that presents itself as civilized but where the government and governmental organizations obvious lack empathy and care for animal welfare. I write this article to make the international society aware about what is happening in this area and I hope that not only Dutch activists continue to stand up for these animals but that they also get support from the international community. The objective is to force the responsible organisation State Forest Service to start feeding on advise of external experts, to open the area for inspectors and press, to come with a long term plan and to hold management accountable for this disaster and its ensueing animal cruelty. * This article is written on personal title and is not necessarily a representation of the point of view organizations Patrick van Veen works for.